The parish of Cley next the Sea is located on the north Norfolk coast, roughly halfway between Wells next the Sea and Sheringham. The village is located in the west, alongside the A149 coast road and to the east of the River Glaven. There are several isolated farms elsewhere. 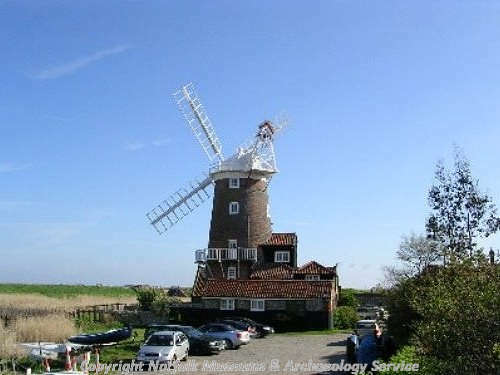 The easternmost part of Blakeney Point and the Blakeney Freshes marshes are located in the northwest and the world renowned Cley Marshes Nature Reserve occupies much of the northeast. 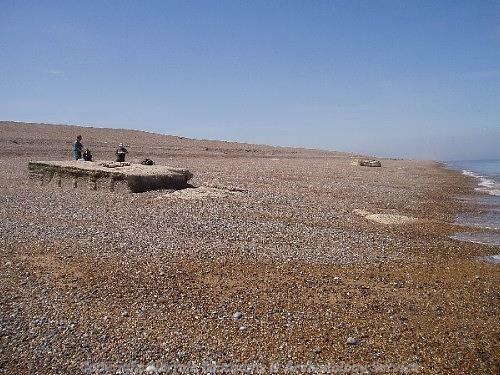 A reasonable amount of archaeological work has been carried out in Cley next the Sea. There have been a few excavations and a good number of site visits. Stray finds have been collected and a limited amount of fieldwalking and metal detecting have taken place. Sites have been identified in most parts of the parish, although there are some large gaps where no sites or artefacts have been recorded. Although conclusions can be drawn about past settlement and activity, the large gaps mean that these cannot be entirely comprehensive. Prehistoric flint artefacts have been found on a few sites. Although some cannot be dated any more closely than the prehistoric period in general, many can. These include a Palaeolithic flint flake (NHER 6177) and two Neolithic polished axeheads. Archaeological investigations (NHER 37793) at Blakeney Eye have revealed Neolithic and Bronze Age pottery, along with a possible Neolithic enclosure, pits and post holes. A small rectangular enclosure (NHER 27173) in the south is visible on aerial photographs and could be a Neolithic long barrow. A Beaker pot has been found in the churchyard (NHER 6144) and part of a Middle to Late Bronze Age spearhead has been discovered. Six Bronze Age round barrows and one possible Bronze Age barrow survive in the south of the parish. Three more were recorded during the 19th century, but have since been levelled. A ring ditch next to one of the upstanding barrows may be the remains of another. Two of the surviving barrows were partially excavated in the early 20th century, with Beaker pottery recovered from one (NHER 6178) and Bronze Age pottery discovered in the other (NHER 6186). Together with round barrows in Salthouse and Kelling, these features are part of one of the largest barrow cemeteries known in Norfolk. A surviving barrow (NHER 6179) to the north is an outlier of the cemetery. This may be also true of three ring ditches, possible barrows, visible on aerial photographs to the south. Two ring ditches to the east could be distant outliers or they may indicate a second site that was used for burials. Two mounds to the east known as ‘Hammer Hill’ or 'Hamburrow Hill' have been interpreted as barrows, although it is more probable that they are geological features. An enclosed settlement (NHER 33526) with a number of roundhouses has been identified on aerial photographs. Although its date is uncertain, it probably dates to the Bronze Age and/or the Iron Age. An Iron Age coin (NHER 31348) has been collected in the southeast, along with Roman coins and brooches. Roman coins and pottery have found on the beach, in the village and at sites in the north and south. 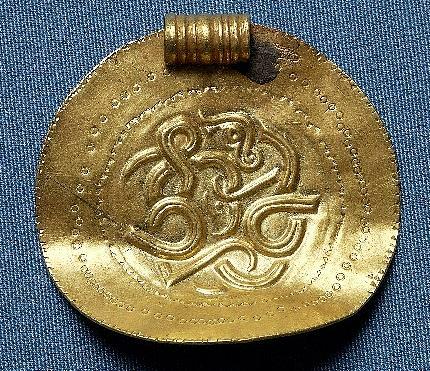 A rare Early Saxon gold bracteate was recovered during excavations at Blakeney Eye (NHER 37793). It is similar to bracteates found in Kent and Lower Saxony and is one of only a few known from Norfolk. Fragments of Early Saxon brooches have been discovered at two sites in the south, with a Middle Saxon pin or stylus collected at one of the sites and a Middle Saxon brooch from the other. Late Saxon pottery has been gathered from Blakeney Eye and part of a stirrup has been found in the south. Cley next the Sea appears in the Domesday Book of 1086 as ‘Claia’. This Old English name means ‘the place with clayey soil’. In 1086 King William I held the land as an outlier of an estate based at Holt. Villagers, smallholders, slaves, ploughs, meadow, pigs and sheep were recorded. In 1253 Cley was granted a weekly Friday market and a yearly fair. The fair was reconfirmed in 1310. During the medieval and post medieval period Cley next the Sea was an important port. Fishermen used it as a base, some of whom were involved in fisheries off Norway and Iceland. Imports included salt, timber and canvas and exports including salted fish and grain. The Glaven channel was more substantial than today and tidal conditions extended as far south as Glandford. The village had a harbour, as did Wiveton on the western side of the Glaven. The harbour was located close to the church and a medieval or post medieval flint and brick wall (NHER 36828) found in 2002 may have been a quayside wall. Six saltern mounds visible on aerial photographs beside the Glaven may be medieval or post medieval. St Margaret’s Church (NHER 6144) was built in the 14th and 15th centuries. It is an ornate church and is a reflection of the wealth of the medieval port. Fragments of stained glass in south aisle date to about 1460 and there are graffiti representing ships. The sites of two medieval chapels are marked in the marshes on Faden’s map of 1797, one on Blakeney Eye and the other on Cley Eye. ‘Blakeney Chapel’ (NHER 6245 and 37793) was excavated in 2003 and 2004 when medieval flint walls, a cobbled surface, building material and artefacts were uncovered. The evidence suggested that the building was unlikely to have been a chapel and that a domestic and/or agricultural use was more likely. A map from 1586 shows the building and a man with a dog and rabbits and hints that it could have been a warren lodge. ‘Cley Chapel’ (NHER 6163) could have been a religious building, although it is also possible that Faden misidentified it. Old Hall (NHER 6150) is located in the north of the village. It was built in the 16th to 17th centuries and probably stands on the site of a medieval manor house. Some medieval elements may survive. Nearby is the Longhouse (NHER 12051), a 15th or 16th century house that has a 15th or 16th century wall painting inside. The farmhouse at Green Farm (NHER 24093) has 16th century elements. In the south of the village the remains of a medieval or post medieval building (NHER 6151) were discovered during earthmoving and medieval pits (NHER 1030) were found during a watching brief. A banked enclosure and an earthwork platform (NHER 33214) survive in the north of the village. Their date and origin are uncertain but it has been suggested that they might be the remains of ‘Black Joy Fort’, a fort that appears on map dating to 1588 and was designed as a defence against the Spanish Armada. During the 17th, 18th and 19th centuries the saltmarshes in the north of the parish were reclaimed and drained. As part of these schemes large sea defence banks were constructed. These surrounded the areas now known as Blakeney Freshes and the Cley Marshes Nature Reserve, leaving only a limited amount of saltmarsh alongside the Glaven channel. A few post medieval banks are visible, such as one in Cow Holme marsh (NHER 27222). Most are concealed beneath modern banks and are visible only on mid 20th century aerial photographs and historic maps. In 1612 Cley suffered a devastating fire and 117 buildings were destroyed. There are numerous post medieval buildings, most of which post date the fire. 17th century buildings include those at Newgate Farm, Manor House, The Gables and The Nest. Starr House (NHER 31024) is a 17th century house with an attached 18th century shop and smokehouse. Cley Hall, The Customs House, Fairstead House, Flanders, The White House, Well Cottage and Rocket House are amongst the 18th century buildings. Maison du Quai is a 19th or 20th century house with a medieval arch built into one wall. Cley Windmill dates to the 18th or 19th century. It is built of brick, is five storeys tall and has cap, sails and fantail (NHER 12388). A lime kiln in the south of the village is marked on Bryant’s map of 1826. An area on the edge of the Glaven is labelled 'Salt Pans' and 'Saltings' on an early 20th century Ordnance Survey map. Rectangular earthworks and low banks, possibly the remains of salt workings, have been recorded at the site (NHER 6152). The parish was heavily defended during World War Two. At the eastern end of Blakeney Point was a coastal battery (NHER 24184). It included two gun emplacements, pillboxes (NHER 23194, 32455 and 32462), barbed wire obstructions and a complex of buildings (NHER 27794), with a minefield to the east (NHER 27752). Sections of the gun emplacements survive on the beach and one pillbox (NHER 23194) survives behind the modern shingle sea defence bank. Immediately to the south of the battery was a military camp, possibly a Prisoner of War Camp (NHER 27793). Between the village and the battery were a spigot mortar emplacement and an Alan Williams Turret gun emplacement. A surviving pillbox (NHER 16026) defended the coast road to the east and there was a pillbox and anti tank blocks on the top of a sea bank in the northeast. Practice or slit trenches were dug in the southeast, possibly as part of training operations on Salthouse Heath. During the Cold War, a Royal Observer Corps observation post (NHER 38339) may have been built into a sea defence bank to the east of the Glaven. David Robertson (NLA), 2 March 2006 (revised 11 April 2007). http://www.norfolkchurches.co.uk/cley/cley.htm. Accessed 6 March 2006.
http://www.cley.org.uk. Accessed 6 March 2006.
http://www.norfolkmills.co.uk/Windmills/cley-towermill.html. Accessed 6 March 2006.